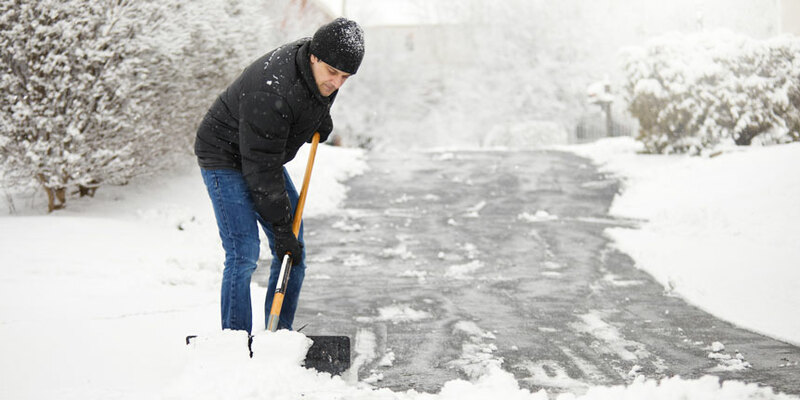 Shoveling snow is moderate to intense physical exercise, so be sure to ask your primary care provider whether or not you are healthy enough to handle shoveling duties. If you have cardiovascular disease and are at risk, leave the shoveling duties to someone else. Choose a lightweight, moderately sized shovel that is ergonomically designed to make the job as efficient and safe as possible. Wear comfortable winter boots or walking shoes with rubber treads and waterproof soles. To avoid slipping, take short, careful, flat-footed steps, spreading your body weight as evenly as possible across the entire surface of your feet. Before you begin, stretch your back, shoulder, arms and legs to avoid muscle strains. Try pushing the snow instead of lifting, if possible. If you must lift, be sure to bend your knees and use your legs to avoid back injury.